In most of the interview, which was split over two parts, Tun M spoke about how money should be spent. It is no secret that the 91-year old ex-premier has struck out with a new political party, but its fortunes are yet to be known, seeing as its leadership has not yet been tested in the general elections. 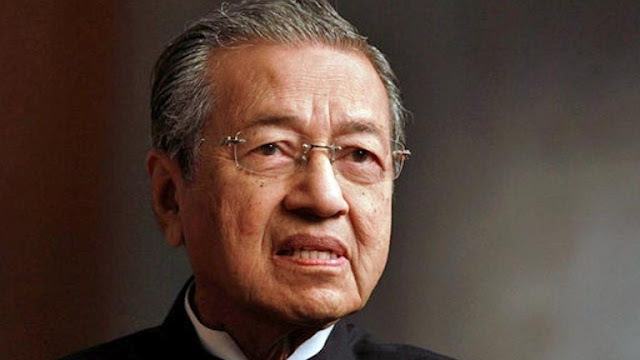 Tun M said that Malaysians should invest money wisely. The interviewer asked him, "Please share an observations that Malaysians can benefit from." His reply doesn't seem to be aimed at any person in particular, but when he makes a point, you can't miss it. The portion that most struck me was the part he said about 3D Jobs, what he called the dirty, dangerous and difficult jobs. The Japanese, said the sagely old Tun M, devised means to get the 3D jobs done, using technology. In fact, the Japanese used technology not only to resolve 3D jobs, they also apply technology for entertainment, pleasure, life support, daily work, transportation, and so on and so forth. (I probably didn't need to tell you that.) What surprises me is that the Japanese don't manufacture the best-selling mobile phone. But then again, that's probably not a technology problem, it's probably more of a marketing problem, due to their language skills. So what are the 3D Jobs that Tun Dr Mahathir spoke about? There is a wealth of information available online on 3D jobs, but one of the best explanations of 3D jobs comes from none other than trusty old Wikipedia. Any task, regardless of industry, can qualify as a 3Ds job. These jobs can bring higher wages due to a shortage of willing qualified individuals and in many world regions are filled by migrant workers looking for higher wages. There's another "D" that wasn't covered here: Drudgery. But it's probably the same thing. Agriculture, manufacturing and construction are some industries that are perceived to involve "3D Jobs". Can technology save the day? MEF executive director Datuk Shamsuddin Bardan said Malaysians typically avoid working in sectors like agriculture or any industry that involves manual labour because society does not view them as highly-respected career choices. “Malaysians shun 3D jobs not because of low wages. The 3D jobs are looked down socially and people doubt the 3D jobs are given any recognition,” he told Malay Mail Online when contacted. He said in order to encourage more locals into 3D sectors, these industries must be modernised and mechanised, and must provide better job incentives. “We can encourage locals to perform the 3D jobs. However the way the jobs are performed needs to be transformed. “Greater mechanisation and modernisation needs to be introduced and implemented. Government, employers, trade union and employees need to work closer to transform the way we perform our works in the 3D sector,” he added. If, having read the above, you feel chuffed and you want to do something to help those workers in the 3D jobs, you may consider innovating something to help them. Obviously, some research skills are required. I have spoken to some successful inventors before. Before creating any "solutions", you need to narrow down the industry. Visit the workplace, speak to people. If you are an inventor with any registered patents to your name, you can offer your services as a "solution provider" through new innovations. If you're not yet an inventor, you can also offer your services as a consultant. Sometimes people are sensitive when a new fellow comes poking around, looking at their workplace. They wonder who you are. Income tax department? Intruder? Competitor? You'll have to show them just who you are: An innovator. If you manage to overcome the initial hurdle of getting let into the premises, the next step is to ask, what are the problematic jobs in this place? What are the most difficult parts of the work carried out here? What do people complain about the most in the course of their work? Have any of the workers ever suggested a change in any part of the work? Why was there no action taken? Then it's time to observe the workers get things done. Watching how people work is really part of the innovation game. You need to see how they do things in order to know, what they are really trying to accomplish. Perhaps many steps are involved, and some could be automated, replaced, or done away with entirely ... what do you see in your mind's eye? This is called the "fresh eyes effect", where somebody who encounters something for the first time asks the inevitable question: Why do they do it like that? That is the question which begins to trigger your search for alternative ways to do the same thing. And then when you've gathered all the data, there is something that you might or might not want to do: Find out how much whatever they are doing, is costing them. And then you have to find a way to innovate and create a solution that does not stray too far from their budget.